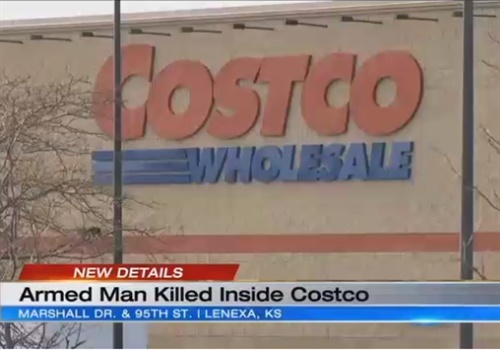 An off-duty Kansas police officer fatally shot a man who was reportedly pointing a gun at shoppers inside a Costco Wholesale store on Sunday, reports KCTV. Police got a call about 11 a.m. about a man who was brandishing a firearm at the store. Witnesses said that the man was yelling and pointing a gun. When officers arrived, they found that the man had been shot by someone inside the store and he was pronounced dead. They then learned that an off-duty police officer, who was shopping there, engaged the man inside the store and fatally shot him. On Sunday evening, Kansas City, KS, police confirmed it was one of their officers who shot the man. Police said they are not looking for any other suspects. "I don't know what his intent was, but before anything really bad could happen, he was stopped," said Captain Wade Borchers with the Lenexa Police Department.